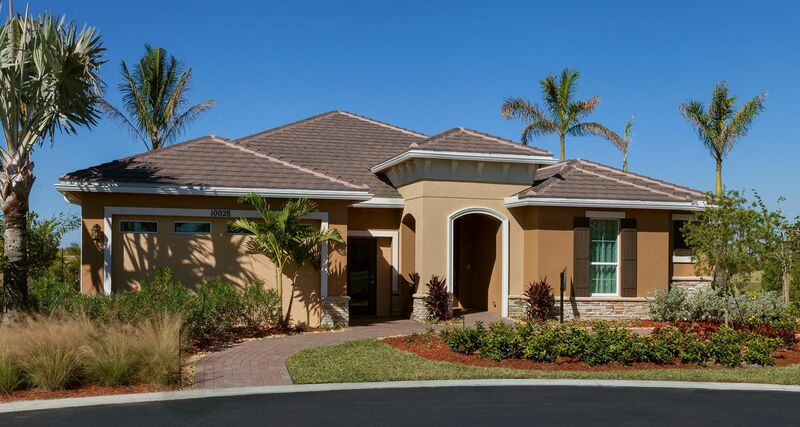 VITALIA Tradition 55 Plus all inclusive retirement lifestyle private community offering NEW and RESALE homes. VITALIA's 450 acres plus is located within the 8,300 acre community of Tradition, situated in Port St Lucie Florida’s famed Treasure Coast with the nearby community of PGA Village and Center of Golf Learning, New York Mets spring training field and award winning Cleveland Clinic Tradition Hospital. Enjoy 3 Days and 2 nights accommodation at VITALIA. Your Discovery Days Package for two people for just $199+ Tax! Including guided tours of VITALIA community and new home models, complimentary full hotel breakfast, complimentary dinner with host family, full access to all VITALIA amenities and recreational activities, tickets to available shows at Captiva Club. Make your reservation today by completing form here. The residential market at VITALIA AT TRADITION 55 Plus is the perfect time to purchase your NEW or RESALE single family home with a wide selection of exclusive floor plans. 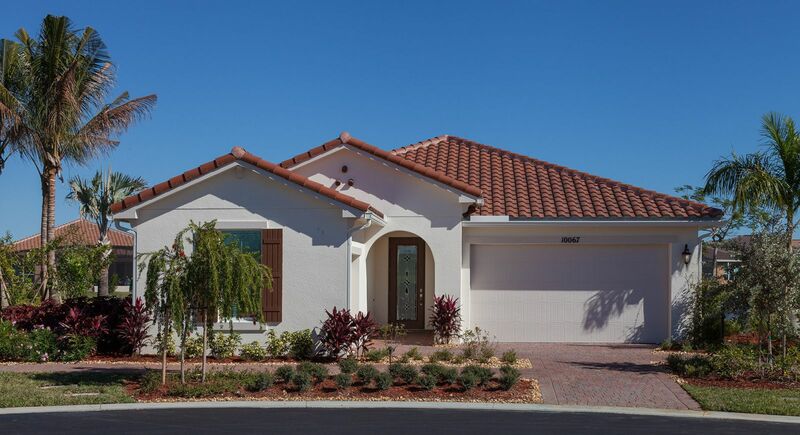 VITALIA AT TRADITION new homes and retirement community offer distinctive exterior appointments. Concrete block construction, choice of exterior elevation, Mediterranean concrete tile roof (Estate Collection), covered rear lanai with designer masonry ceiling finish, brick paver driveway front porch and matching entry walk and rear lanai. VITALIA AT TRADITION luxurious interior features include elegant 9’4” AND 10’ ceilings throughout, tray ceilings, generous 5-1/4” baseboards, knockdown texture on ceiling, orange peel texture finish on walls, decorative drywall niche, marble window sills, large walk-in closet in master bedroom. Contemporary kitchen features double compartment stainless steel sink, granite counter tops with a decorative edge and 4” back splash, upgraded pull-out spray single lever faucet, side-by-side General Electric refrigerator, range, microwave, dishwasher (choice of colors). Washer and dryer hook-ups, security system, wired for TV and data in all bedrooms and living room, security system with one keypad and sensors on all doors and windows. Pre-wired for ceiling fans, minimum 40-gallon gas water heater, high-performance insulated windows, hurricane-resistant aluminum shutter panels, one-year termite protection from original treatment. Professional landscape package included. Home personalization options and upgrades available. For more information about a community tour or building your new home in VITALIA Click Here. 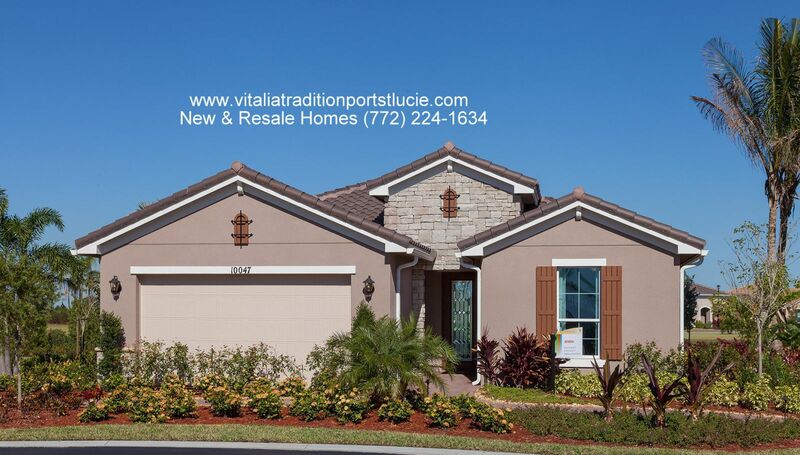 VITALIA AT TRADITION READY NEW AND RESALE HOMES AVAILABLE NOW! Ready Now NEW Single Family Homes and RESALES 55 Plus featuring upgraded gourmet kitchen, crown molding, ceramic tile and much more. For current list of available homes to close in 30 days or less click here. ASK US ABOUT CLOSING CREDIT INCENTIVE AVAILABLE FOR NEW & RESALE HOMES NOW. PGA Golf and Learning Center: The PGA Golf Club offers three public championship courses designed by legends Tom and Jim Fazio and Pete Dye, plus the new PGA Learning Center with over 35 acres of golf fun for players of every age and skill level. PGA memberships range from affordable single and family to a premier golf membership for extremely active golfers. Additional amenities include a full-service clubhouse complete with a grill room and an award-winning golf shop. Health Care: Three nearby hospitals, Tradition Medical Center Martin Health System, Lawnwood Regional Medical Center & Heart Institute in Fort Pierce, St. Lucie Medical Center in Port St Lucie and Martin Memorial Health Systems in Stuart providing complete modern medical care including 24-hour emergency services. Martin Memorial Emergency center located in St Lucie West area. Concierge: Bold Real Estate Group will provide concierge services including set up of excursions and area information. Who to Contact for more information about VITALIA AT TRADITION? 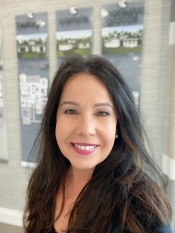 Contact VITALIA Certified New Homes Community Agents Millie Gil (772) 224-1634 or Carlos Gil (772) 224-9011 for a Complimentary Tour of your dream home in VITALIA. For more information by email click here. Having a Certified New Homes Community Agent means having an Agent who is committed to helping you buy your new home in VITALIA with the highest level of expertise. This means also to help you in understanding each step of the buying process of a new home. This commitment level has helped us build a remarkable track record of delivering results. Nothing is more exciting to us than the gratifying feeling we get from helping people meet their real estate needs. You can count on us to always do what's in your best interest. We pride ourselves on being honest, trustworthy, and knowledgeable in the real estate market. We know how important it is to find your dream home. Therefore we will make it our responsibility to help you achieve those goals. Whether you are an experienced investor, first time or second home buyer, we can help you in finding the property of your dreams. Please feel free to browse our website or let us guide you every step of the way by contacting us to set up an appointment today. Your best investment opportunity is at VITALIA 55 Plus community!